A second collection by the alter ego of John Irwin, the Johns Hopkins humanities professor and author of a few critical studies of American Literature (The Mystery to a Solution, etc. ), inaugurates a new series co-published with the Sewanee writers— conference and subsidized by the estate of Tennessee Williams. 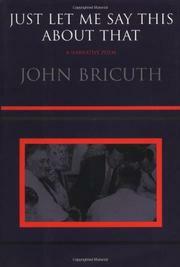 Bricuth’s book-length narrative poem intends to instruct and delight in true classical fashion, but organizes itself as a press conference, that most timely form of communication. The interrogated —Sir,— part statesman, part entertainer, part patriarch, and partly divine, tries to answer the existential questions posed by —Fish,— —Bird,— and —Fox,— who seek —a code of how to be/ And what to do.— The opening shots begin with a barrage of Joycean riffs, a sonorous binge of alliteration and rhyme that ill prepares the reader for Sir’s —wry bonhomie,— his chatty means of evading their urgent queries with slow parable, extended sports metaphors, and frank language, which all draw on a wealth of popular and literary imagery and allusion. Bricuth’s virtuoso performance never sags, even if it never rises to Olympian heights—the section suggesting that —Every Job’s just another Joe to— Sir best articulates his grim truths about —the sour rag of the self— and his millennial dread. With wit and considerable wisdom throughout this always-engaging poem, Bricuth clings to the occasional surprise by joy—a tonic for anxious times.